In our third year ranking the best coworking spaces, we have discovered that the best ones are much more than a shared office space. They not only create ideal places to get work done, but they are also creating centers for innovation. They create outstanding local networks of like-minded founders. The best coworking spaces have great wifi, awesome coffee, extraordinary events, and happy clients. 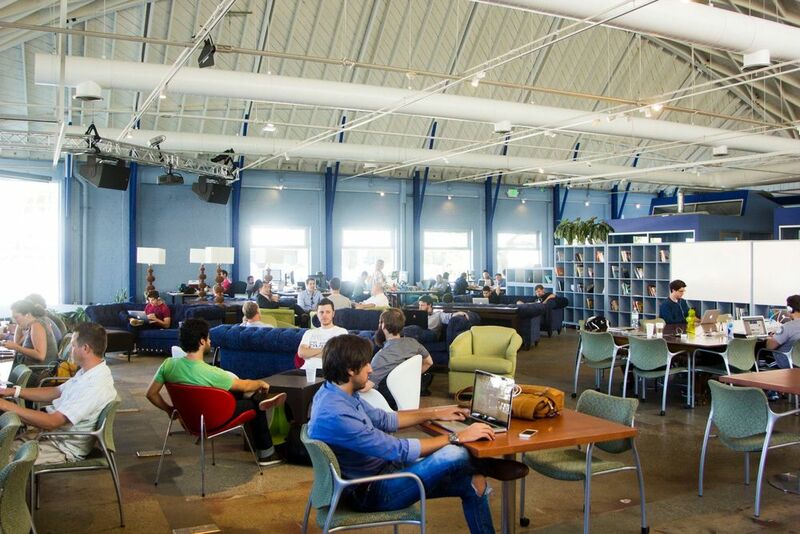 Here are the top coworking spaces in the world. betahaus | Berlin is designed to constantly meet the requirements that independent, creative professionals have for their work station. Spread out over 5000 square meters on five levels, betahaus offers spaces and rooms designed to flexibly serve multiple purposes. Their ambiance range from the laid-back atmosphere of a cafe to the seriousness of purpose found at a campus library. There are coworking spaces, a community space, team rooms, meeting rooms and event spaces in various sizes, a hardware lab, a wood workshop, and a café. Whenever you’re in and whatever you’re in for, you will always find a place that fits your needs. Whether it is to network and collaborate, or to have a productive day; to develop skills, push innovation, or exchange ideas and get inspired. Cowork Central is a hub for creative, independent minds situated bang in the heart of Lisbon. As well as a desk and office space for freelancers, startups and small companies they provide a range of services with the goal of enabling you to focus on what’s most important: the success of your business. They provide flexible desk and office space for all types of user, whether you are a remote worker or freelancer looking for an occasional desk to break the monotony of working at home, a startup looking for your first office, or a small business moving to Lisbon and in need of somewhere to get your Portuguese team up and running quickly. Since its creation, 3 years ago, MOB has been continually evolving, changing, molding, moving, shaking, causing a stir and making a splash around their particular set of core objectives which clearly define us. What defines MOB is not simply 'coworking', an event venue, a maker space or a school. What defines MOB is what happens inside these spaces, the drive of their members to connect, collaborate, create, explore and evolve as a community. Because inspiration doesn’t work from 9-5, neither do we. Memberships at MOB are as unique as the members of their community; with prices ranging in times, spaces, and hours needed. It’s your schedule, build and make it exactly how you want it. utopic_US is a coworking space, a place for ideas, training, and social and creative transformation. It is also an original coworking space concept open to freelancers, self-employed workers, and firms that want to work in a collaborative environment in exchange for services, products, ideas and knowledge. At utopic_US, your development tracks grow bigger, feeding on the working ecosystem around them and connecting online through the virtual coworking platform that utopic_US provides. Besides coworking, utopic_US hosts in its spaces several training schools (design, humanities, photography, apps, programming, music), an art gallery (utopic_Gallery), a gastronomic bar and many transformative projects. Transforming the way people work. They offer the ideal environment for growing your business & creating strong networking opportunities. At Central Working, you have the flexibility to scale. No leases, no worries. You’re free of all the hidden hassles like rates, cleaning, and bills. You’ll be 100% focussed on what really matters. Growing. When you join Central Working you join a collective of hundreds of members who are passionate about what they do. All there to help each other grow, thrive and succeed. And a dedicated team who connect you to who you need, just ask. BHIVE Workspace takes pride in being the largest coworking space in Bangalore, India’s startup capital. Their hybrid workspaces are innovative office spaces and business centers with a focus on coworking and community. They provide an ecosystem for entrepreneurs and startups to take their ideas to the next level. The BHIVE Team adds value by enabling the startup community to cowork, connect, contribute, collaborate, communicate and commercialize their ideas. One Roof is leading the industry for global co-working spaces dedicated specifically to women-led businesses. So much more than a co-working space One Roof provides 24/7 access to beautiful indoor and outdoor shared workspace, private meeting rooms, access to a supportive community of like-minded entrepreneurs, events, workshops, affordable professional services, business support, yoga, meditation and more. Australia's largest coworking community offering beautiful places to work, events, and venue spaces. A home for small business, entrepreneurs and edge thinkers. Hub Australia is Australia's largest network of coworking spaces for growing small businesses. With beautiful spaces, learning and wellness events, and flexible memberships, Hub provides workspaces that love people. The Hub in Sydney not only provides what is expected of a coworking space (world class facilities, comfortable space, general supplies), they do so with such a high standard of community engagement and sense of family. While a community is built by the people who are in it, this coworking community is fostered and developed not only by those using the space, but most importantly by the great staff who host the space. An intentionally diversified membership base (including artists, executive directors, founders of the latest tech startups, private wealth managers, executive coaches to reference just a few) and frequent experiments with design reflect collaboration with members’ desire for innovation and workplace strategy. Work Club is a leader in the new work culture movement. Urban Station is the first global network for mobile workers and everybody who shares the idea that there are other ways to work and meet. Their main goal is to set up different workstations close to people. They offer all office services necessary to work or have meetings, flexible spaces to suit your needs, networking enhancement and different programs to help you. Their system is simple. You go in, you choose where to sit, you log in, you get what you like from the coffee break service, and you just pay for the time you work. A space that brings together young people, entrepreneurs, freelancers, organizations and startups that enhance the new generations of entrepreneurs to create sustainable, innovative companies with solid business models. Designed for those working alone at home or in a cafe, but they understand the power and value of collaboration: a chance to meet others, fed back into talks of coffee, lunch together, or be connected through events organized within from space. NGIN is an intelligently designed premium workspace, centrally located in Kendall Square for startups and entrepreneurs who know that the key to success starts with a superb work environment. A strong community is the backbone of shared workspaces and that’s no exception at NGIN. With a diverse group of innovators in a variety of industries, you’ll be surrounded by brilliant minds 24/7. You’re an entrepreneur. A 9-5 schedule is a foreign concept to you, which can make healthy living a challenge. From carefully selected organic snacks & organized team runs, to weekly in-office Yoga & CrossFit, they’ve got your well-being covered. At Workbar, they understand that people just don't work the way they used to. Technology has made the workforce more mobile, yet has also increased the need for shared resources, human interaction, and just plain old-fashioned fun at work. So they've created a web of communal workspaces where freelancers, start-ups, and remote employees of larger enterprises can enjoy high-quality office amenities at an affordable price. At convenient and accessible locations around the cities of Boston and Cambridge, they provide an extraordinary workplace for their members; meeting rooms to meet with clients and give presentations; event space; and a wide variety of social and educational programming including happy hours, lunch seminars, workshops, and networking events. In a nutshell, Workbar offers the professionalism of a corporate office, the flexibility of a gym, and the comfort of a cafe. Made up of thriving start-ups, creative entrepreneurs, independent professionals, and enterprise teams, the interactive and collaborative atmosphere of Workbar gives you access to all of the resources your business needs to grow. Their members not only enjoy a motivating and productive work environment, but a strong network of friendship and support from a vibrant community full of professional and social connections ready and willing to help each other build, create, and grow. Common Desk is a shared workspace for freelancers, entrepreneurs, and some of Dallas' best small companies. Common Desk's focus is to provide beautiful workspaces that are designed and staffed to help people collaborate with others and work harder. Their original location is in Deep Ellum and they have a second location in Oak Cliff. Common Desk began with a vision to redefine the way Dallas perceived a workspace. By creating a stimulating coworking environment for both Dallas’ suit and tie professionals and artistic freelancers, the Common Desk community gained strength through the diversity of its members. Today, over 300 companies consider Common Desk home. Gravitate is one of the top coworking spaces in the world because of the philosophy behind the coworking space. They are committed to offering an amazing location, entrepreneurial vibe, and invaluable connecting and business events. They also support Iowa's startup community. Gravitate is at the forefront of coworking in the state of Iowa which has been undergoing something of a tech boom. Facilitating not just the work of entrepreneurs but also the networking, Gravitate is an incubator of the next big ideas in Des Moines. Cross Campus is Southern California’s leading network of collaborative, on-demand workspace and business event venues. With a focus on design & user experience, best-in-class event programming, and a diverse community of innovative members, Cross Campus has become known as “the nerve center of Silicon Beach.” Founded in 2012 by Ronen Olshansky and Dan Dato, Cross Campus has locations in Santa Monica and Pasadena, and is expanding to Downtown Los Angeles. Miami Entrepreneurship Center (MEC261) is the epicenter of Miami’s coworking and entrepreneurship community. Be part of their mentor network and help entrepreneurs get started. They have strategic partnerships with many Miami coworking spaces so entrepreneurs can come to the center and benefit from education, connections, and support services at no additional costs. Coworkrs is a stimulating collection of communal coworking and private workspaces in New York City. Their locations in Manhattan and Brooklyn include fully stocked kitchens, roomy conference rooms and lounge areas, private office suites, and countless amenities to provide members the freedom to work creatively and effectively, while still having fun. They offer 24/7 headache-free access to the full-service office amenities you need to focus on your business. Their collaborative and comfortable environment welcomes all. Members at Coworkrs are everyone from freelancers and creative agencies to tech startups and even high-growth established companies. At the Ensemble Coworking Space, they are not an office. They are a collection of people, ideas, and aspirations. A coworking space defined by collaboration, not cubicles. More than just a work destination, Ensemble plays host to lectures, networking events, and social engagements. They unite creative professionals and young firms through the idea that a dynamic and fun space can be the best place to grow your business. NYC’s most engaged community of designers, developers, social change agents, artists and entrepreneurs that have converged to share ideas, innovate and learn in a collaborative and nurturing environment. Located in the heart of SoHo, the hippest district in Manhattan, close to all the major subway lines and hottest tech companies such as Squarespace, Meetup.com & Square, The Farm SoHo will wow you and your guests with its rustic charm and inviting environment. Home to Blueprint Health, NYC's biggest health-tech accelerator. Click here to visit their coworking space in New York City. The largest coworking space in Arizona. They focus on the new generation of entrepreneurs. They offer shared office space for creative class professionals to work, collaborate, share ideas and grow their business. More than just a beautiful space. CO+HOOTS’ diversity of skills and people; its atmosphere and its energy activate great business. Their flexible membership tiers allow their members to concentrate on their business, which total more than $14 million annually. CO+HOOTS is intentionally designed to help your business thrive. Gangplank is about collaboration. What makes Gangplank unique is that they are run off social capital. This means that every member of their community contributes to make Gangplank what it is. They do not charge a monetary fee but rather ask that you give back with time, talent, and relationships. More than a shared office space, they foster a culturally diverse community of professional leaders, entrepreneurs, and business owners. You provide the passion and they provide the space, equipment, and connections. Regardless of what stage you are in your life or your business, they encourage diverse businesses, personalities and cultures to grow together. The Office Pile is located in a beautiful historical building. It has been renovated to have all the modern conveniences that are needed but without losing the historical ambiance. But most importantly, it is the friendly people that make it the best. Their coworkers are more than just professionals. They are entrepreneurs, designers, coders, creatives, and changemakers who make our world better with the companies they build, the people they help, and the products they create. They support your entrepreneurial and creative ventures by offering shared workspaces, private offices, meeting and conference rooms, as well as regular classes, workshops, and networking, educational, and social opportunities. The HIVE 44 Coworking Business Center in Fenton Missouri is a collaborative workspace designed for the self-employed and small business professionals sharing the amenities of a professional office space. The environment at The HIVE 44 is fresh and energetic; surrounded by other professional businesses and creative individuals who are leading industry experts. The HIVE 44 provides the physical infrastructure so entrepreneurs and small businesses will not have the worry of the high cost associated with having an office and concentrate on their business. The HIVE44 includes everything that a small business needs to run their company from copier to workspace, meeting rooms to storage. The HIVE 44 has built a community of diversified individuals and small businesses that have created a collective of local business professionals. Encouraging collaboration between members to increase business profits and business development through education. Hera Hub is a shared, flexible work and meeting space (coworking) where entrepreneurial women can create and collaborate in a professional, productive, spa-like environment. The platform provides members with connections to other business experts, access to educational workshops, and visibility within the community... thus giving them the support they need to be prosperous. They offer access to private meeting rooms, conference rooms and shared workspace. They host weekly educational workshops to support their members in every stage of business launch and growth. Hera Hub members find the shared office space model is cost-effective and flexible. Their supportive, collaborative community allows their members to network with like-minded female entrepreneurs and find business support services to help them grow and flourish. 1920C is a coworking collective and creativity hub in Chinatown, San Francisco. They offer hourly, daily, and monthly shared workspace memberships, meeting room rentals, and event space. They also have an art gallery with rotating exhibits to support local artists and nonprofits. Not your typical workspace. Their community is a group of change-makers and go-getters. Those looking for a better place to work and be productive, one that is beyond coworking. A collective space that incorporates wellness, sustainability, local community, and collaboration. A space where you can meet your fellow neighbors and co-create. A hub for all types of professions to come together to work under one roof. Works Progress is a coworking space for a diverse group of professionals to work, connect, and grow. Their all-inclusive space enhances productivity, supports career advancement, and cultivates community. All memberships include comfortable workspaces, fast wifi, unlimited printing, reservable conference rooms, private call rooms, kitchen space, and complimentary coffee, tea, and snacks. Freelancers, entrepreneurs, digital nomads, startups & business owners connecting globally.